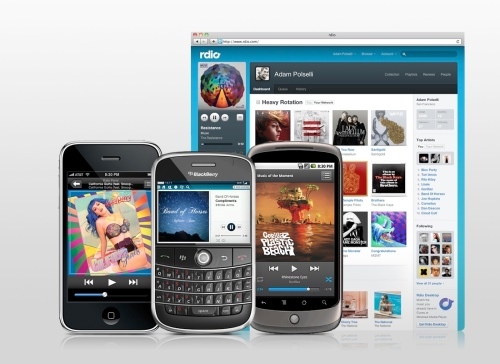 The rdio music streaming service hit the North American netwaves, early last week. It is the latest offering from VoIP giant Skype who recently invested $6 million enhancing the user experience and streaming stability. What sets rdio apart from other music streaming services like pandora, is the ability to choose what you want to listen to, create playlists and share your musical interests with friends. It’s social networking meets jukebox in a big kind of way. You can try out the service for free for 3 days, you’ll then be asked to dish out $4.99 for web only access or $9.99 for unlimited access. The more expensive package allows you to stream to your smartphone, currently supported on iPhone, Android and Blackberry. It also allows you to sync your favorite music for offline listening. The features of rdio are well thought out. I like the ability to create playlists and also to create ‘artist playlists’ based on a selected song similar to iTunes genius. There is no shortage of music to choose from either. I was impressed to find a massive collection of Phish and other jam bands. Once I had started listening to several songs, rdio started to get a feel for what I’m interested in. Recommending artists that I had never heard of and I was blown away by when I heard them. I had been listening to a little Stone Temple Pilots and, I guess the album or playlist ended and automagically an similar type of artist started playing. Ebba Forsberg, sweet sounds, great lyrics, and nice gritty guitar playing. I also like that they give you an rdio address to share with your friends. If you are a want to be DJ and think that you’ve found something that others would like, fire them off the link to your rdio station and you’re off. There is also full integration with Facebook, Twitter and Last.fm. I was happy to see the last.fm integration, keeping track of all my preferences and tying in my iTunes library. Actually, rdio also provides an iTunes matching service if you don’t have a last.fm account. No song is copied over to their servers, it is simply a matching service. Rdio makes a list of all your artists, albums and songs and adds the ones that they have to your collection. The list is then deleted. It is just a way to build your collection without starting from scratch. A lot of time and effort is put into managing an iTunes or Media Player library. This entry was posted in Music and tagged canada, music streaming, rdio by Paul Blouin. Bookmark the permalink.